HAYMARKET nominated for 6 Jeffs!!! I am so proud of the love, dedication and prodigious talents everyone poured into this production and not least of all Underscore Theatre for assembling the amazing team and supporting the show every step of the way. See you at the Jeff’s! Originally posted on Facebook on June 12th, 2016. Today we close Haymarket. It’s the most rewarding project I’ve ever been involved with. I am simply in awe of the amazing performances the cast, crew and designers have brought to the table throughout the process, and the unbelievable amount of work they have all put in. What an absolute privilege, honor and joy to have so many people give so much to make my dream a reality--really, to make it their dream too. Thank you to all who poured their souls into this work, and to the many critics who have chosen to write kind words about our baby. When you are cast in a new musical, no one has ever played that part before. You have no cast recording to listen to, no photos, no videos to watch. You are the first person to ever say these words on a stage. You must create your character from scratch. There is no copying. There is nothing except you and the text, and some dots that tell you the right pitches. And in the case of Haymarket, the historical record. Every one of these actors did their homework. They learned all they could about their characters so they could bring them to life as realistically and faithfully as possible, while injecting their own personalities in to give the characters warmth, dimension, and heart. These actors did not just have to show up and say their lines, or even sing. They had to play instruments at the same time. Some of them even LEARNED instruments specifically for this production. Not only that, but they had to create the orchestration themselves. Sure, there was guidance from me and Robert, but the music in the end truly comes from the actors, full of original countermelodies developed in rehearsal, little improvisations and the personal flair of each player. 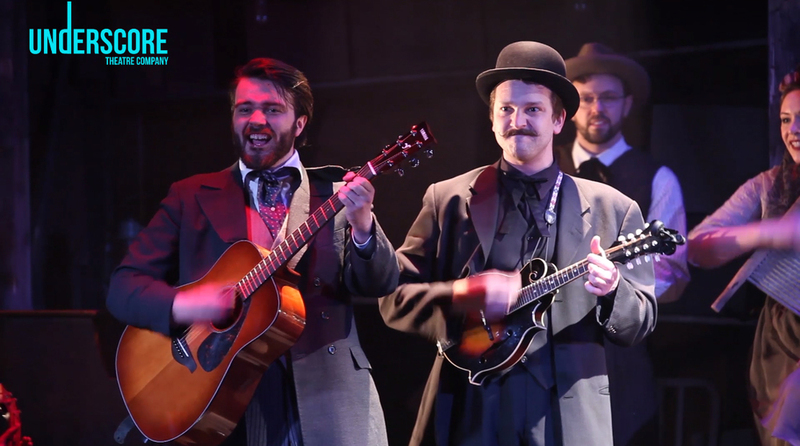 Many vocal harmonies were improvised by the actors as well. Under Elizabeth’s guidance, in many cases they devised their own movement and choreography. They handled notes from director, stage manager, composer, and playwright. Each plays their own part with fire and passion, and then blends seamlessly into a vibrant ensemble full of energy that erupts off the stage. I could not have asked for better actors on any production. When you design for a new musical, there is no template. No photos, no video, no reviews. The lights, costumes, sound, set and props for Haymarket all came 100% from the brains of the incredible design team, to portray the concept and vision that Elizabeth conveyed to us. It was no easy feat, to balance our minuscule budget and technical limitations with the grandiose scope of this wayyyyyyyy-too ambitious show. But they went above and beyond what Alex and I ever imagined possible. And they made it seem easy. All working for us for much less than they’re really worth, because they believed in our show, they were total pros, with everything coming together just when it needed to. And it paid off, as their many, many shoutouts in the reviews attest. I very much hope they will be nominated for awards for their incredible work on Haymarket. Continuing our journey through this dream team, we come to Music Directing. Robert and Tyler had no Broadway Cast Recording to listen to. All they had were awful crackly demos of me singing in my bedroom (or sometimes even my bathroom) along to my lousy guitar playing or terrible synthy MIDI tracks. They had to deal with discrepancies between script and score, typos in the score, lyric changes, melody rewrites, harmonies being added, me nitpicking about tiny rhythmic idiosyncrasies, rearranging sections of music, cutting songs, writing new songs in rehearsal, getting new scores on the day of rehearsal, hearing impossible orchestration demands by the composer and somehow making them happen. They suggested new keys when songs were written in odd ranges for the singers. They had amazing ideas about the orchestration and crafting a unified sound for the show. Creating transitions and underscoring. Teaching harmonies and sometimes rewriting them when I'd screwed up, teaching the cast how to conduct themselves, without a pit band to follow...the list goes on endlessly. This was a true collaboration between composer and Music Directors. I am forever grateful for your tireless work in bringing my music to life. There is no Jeff award for best Stage Manager, but I must shout out to JC for her incredible management of all the ridiculous moving parts in this show. Tracking props, a stupid number of instruments, actors who can’t leave the stage for their costume changes, imagining set levels that didn’t exist in our rehearsal space. I can’t believe you made it happen, but you did. You get the David Award for Best Stage Manager. Lastly, there is no template for directing a new musical. There are no original stage directions. There is no broadway bootleg recording to watch. There are no reviews of prior productions to read. Elizabeth had to invent every image in the show from her mind. She read the primary sources and educated herself on the historical records and images of the time to inform her concept. She encouraged the cast to bring in images that inspired them, from quotes of Lucy Parsons to shots of Freddie Mercury onstage. She had to negotiate with the overbearing egos of a nitpicky composer and playwright. She had to literally shape the script of the play by helping Alex and me streamline the script, clarifying, rearranging scenes and making judicious cuts, interpreting our story and seeking out the best possible way to tell it faithfully. She lost hours of sleep wondering how to make this damn script work. Most importantly, from the time we met in that bar on Navy Pier, Elizabeth put her faith into an unknown quantity, with no guarantee of success. An unknown show, by unknown writers, at an unknown company. And she gave it everything she had, because she believed it was a tale worth telling. If someone who can do all that with grace and aplomb, and come up with a production this beautiful on such a tiny friggin budget, is not the best director in Chicago, I don’t know who is. Thank you all, from the bottom of my heart and soul. I have finished the preliminary master of the Pr0ne Original Chicago Cast Album! You can listen to it below. Please leave a comment about anything you like or hate on the tracks! I'm still doing a bit of tweaking on the mix before publishing to iTunes. For now, you can download it for free and share with anyone you please! I promise no one will get mad or sue you. We just want this show to become a viral cult sensation! Check out this article about a toddlers' music class I teach sporadically for Bubbles Academy. They misspelled my name, but that's nothing new. And there are some pretty cute pictures!